We currently have eight members and would love to welcome more. Our roster includes Kay Bleakley, Kathy Hagan, Brucie Hopkins, Lynn Mackle, Betsy Parker, Adele Scielzo, Genie Shoffey, and JoAnn Stultz. 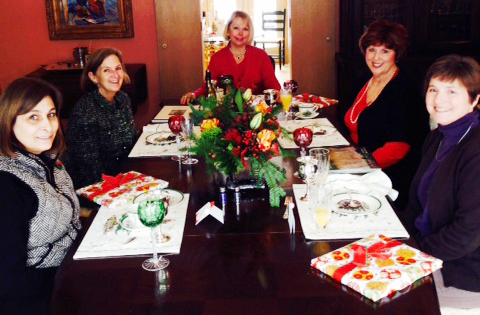 We host guest speakers at least once each year, and we hold a spring luncheon and a festive Christmas gathering in the home of our presiding partner. Field trips have included visits to Kansas City companies in which we have been invested, including Cerner, DST, Garmin and Kansas City Southern. Our own Jan Rowe has spoken with us many times over the years, allowing us to gain the benefit of her professional insights. Our most recent speaker was David Bleakley, husband of our secretary, Kay Bleakley. David serves as the executive vice-president of Colt Energy, Inc., and he enlightened our group about many interesting facets of the timely oil and gas industries. If you would enjoy the camaraderie and educational opportunities offered by a congenial investment group, consider visiting us! We meet at Junior League Headquarters at 9:30 a.m. on the fourth Thursday of each month. For information, please contact Lynn Mackle, 816-304-6393. This entry was posted on April 7, 2015 by JLKCMO in Sustainer Perspective.